The early years are a unique developmental window. From the moment they are born, children build cognitive, social, emotional and language skills which establish the foundations for learning and success. However, the extent to which they develop these essential skills depends a great deal on whether or not they have access to certain types of experiences and interactions. All too often, children living in poverty are deprived of the early learning opportunities that will equip them to create a brighter future for themselves. Access to ECD programmes in South Africa is not spread evenly and children in poor communities lose out most. It is estimated that in the poorest 40 per cent of households, only 20 per cent of birth to four-year-old children attend some form of out-of-home care. Where ECD programmes exist, they often do not deliver the types of high quality programmes that will ensure good outcomes for children. Sometimes this is because the sites are under-resourced or in inappropriate facilities. However, practitioner knowledge and training are also a significant issue. Many practitioners cannot access formal ECD qualifications and therefore do not access any training at all. Playgroups and childminders are sometimes referred to as non-centre based ECD programmes. These types of programmes are often relied upon by vulnerable families for both childcare and access to appropriate learning and development opportunities. can work in partnership with government employment schemes (such as CWP and EPWP). Importantly, research suggests that good outcomes for children can be achieved in these kinds of settings so long as the components of quality are in place. SmartStart’s vision for the future of early learning in South Africa is at once exciting and ambitious. However, we cannot achieve it on our own. Partnerships – with individuals, with communities, with the ECD sector, with government and with investors – will be the key to our success. We believe that working together we can take early learning opportunities to many more children in a much shorter space of time than would otherwise be possible, transforming lives, creating jobs and uplifting communities. 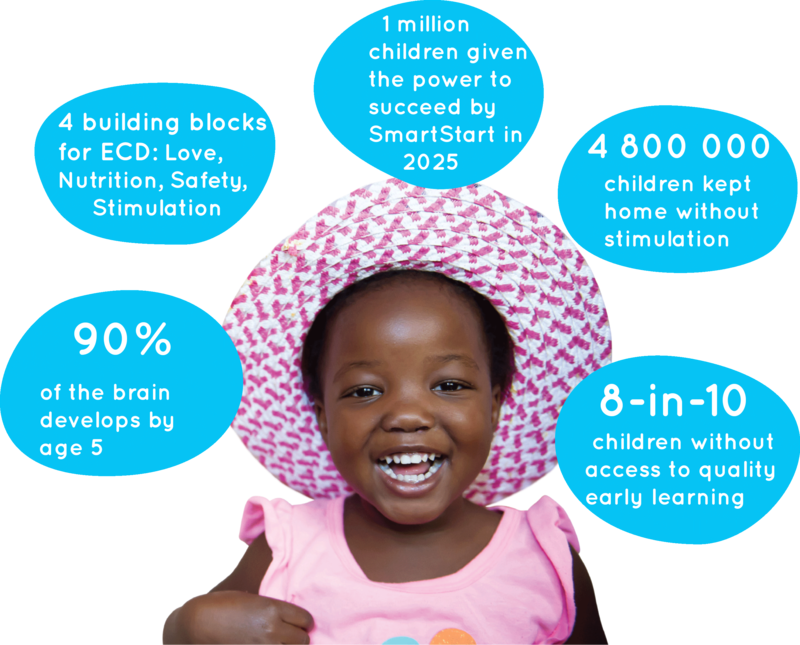 Put simply, SmartStart is a vital part of the solution to South Africa’s ECD challenge. We have successfully tested a model for early learning at scale, demonstrating that we can play a significant role in helping the government to achieve universal access to ECD. We are part of a natural coalition that stretches from investors to Franchisors to communities, all working towards the same goal – wider access to high quality ECD. The architecture of our model means we have direct practical experience at all levels of ECD programme design, management, funding and implementation. We have designed our programme based on extensive research on what works, and we are now collecting evidence from implementation. We are experts in our field. We have developed high quality operational tools and programme resources, which have broad application in the ECD sector and could be used by other organisations. We have a positive and inspiring brand, which is increasingly known, and over time will be treated as a stamp of quality.